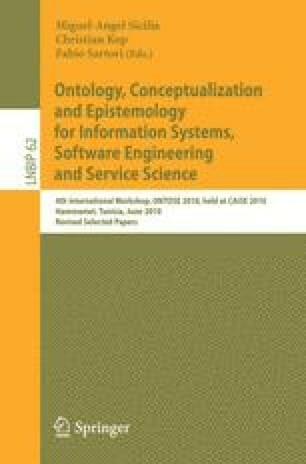 The complexity of service systems has raised interest in developing ontologies that contribute to the conceptual clarification of value co-creation activities and that eventually serve as knowledge representations for systems exploiting reasoning and inference on those ontologies for various practical purposes. The Resource-Event-Agent (REA) enterprise ontology shares similar aims even though it addresses the more generic domain of economic phenomena as modeled by interchange events between agents. In consequence, the REA ontology appears as a good candidate to serve as a framework for a module dealing with an event based account of service provision that could be part of a broader service system ontology. This paper reports a preliminary analysis of the applicability of the REA enterprise ontology to the service domain, according to its formulation by Geerts and McCarthy  . Service provision can be modeled as a kind of REA transfer, and the selling of a service that will be provided in the future can be modeled by associating the selling with the commitment to provide the service associated with the transfer. Different kind of resources can be used to model intangibles that are put into action during the service encounter itself, and a separate event structure can be used to model the service encounter. The paper sketches a preliminary refinement of the REA ontology to explicitly account for these aspects.